I love scones. They are one of my favourite treats, (ok, I have a lot of favourites) right up there with cinnamon buns and banana chocolate chip cake. Now I know that these are shortcakes but the helpful people who contribute to wikipedia tell me that shortcakes are aka scones. So I consider these scones by another name. I made them last night and didn’t have anyone to share them with so I ate two *gasp* I know, summer is coming and shorts and tees abound but I couldn’t stop myself. 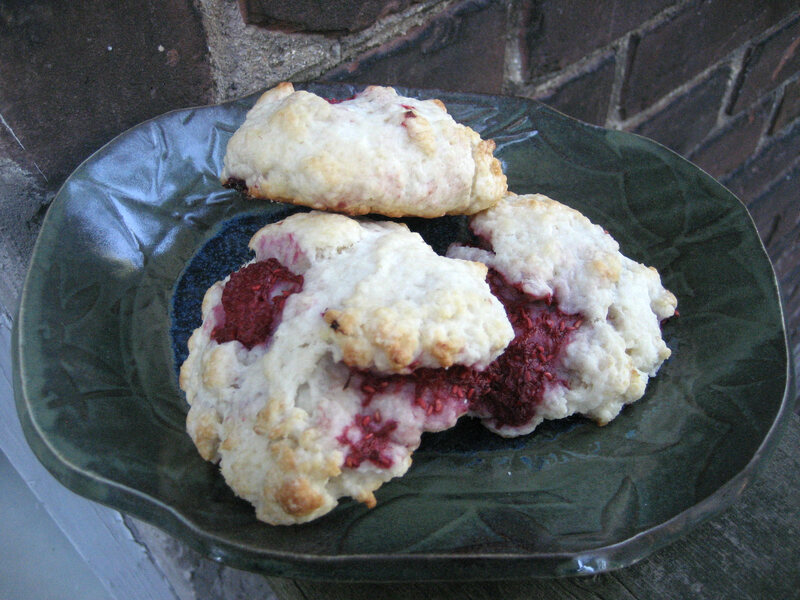 I halved the recipe and made 6 plain shortcakes/scones and 4 raspberry ones (I couldn’t leave well enough alone and had to add fresh raspberries!) Admit it, you wish you could taste one. The raspberry ones were delicious. In addition to the raspberries, I added an extra tbsp of sugar and I substituted 2% milk for the cream (somehow I knew I would eat two!) I didn’t serve them with whipping cream because it is not my favourite. That’s the beauty of being the baker I get to pick how it all works out. I ate them straight up and so will my taste testers. S. will be stopping by later today to pick up his treats. For the recipe head on over to Tortefeasor. Thanks Cathy for a GREAT choice. PS It’s Claire’s birthday today! Join me in wishing her a happy, happy birthday! Being seven years older I remember the day she was born and I am super lucky that she grew up to be a great sister AND a baker. Happy Birthday Claire!!!! PPS The beautiful pottery dish in the picture came from Susan Card’s studio in the Distillery District. The Distillery is one my favourite places in Toronto because it is filled with local artists, great food and beautiful buildings. I love pottery and I am impressed with Susan’s work especially because she has little platters that I can serve my baked goods on. Be sure to stop by Susan’s gallery the next time you are down there. I made these on the weekend to take with me for a Sunday lunch with friends. Sunday was beautiful in Waterloo and we spent the afternoon eating yummy bbq and enjoying the sun. This seemed like a great recipe for a summer-ish day. I was all over this recipe as I love white chocolate and raspberries. But I have to admit I really didn’t dig these. I made the coulis which was delicious, but otherwise found them a bit bland and dry. S. on the other hand dug them quite abit so maybe I am not the best judge. If I made them again I might add chocolate chips or something else to jazz them up. (Note: I didn’t make the meringue as this made a big pan and you can’t freeze meringue). 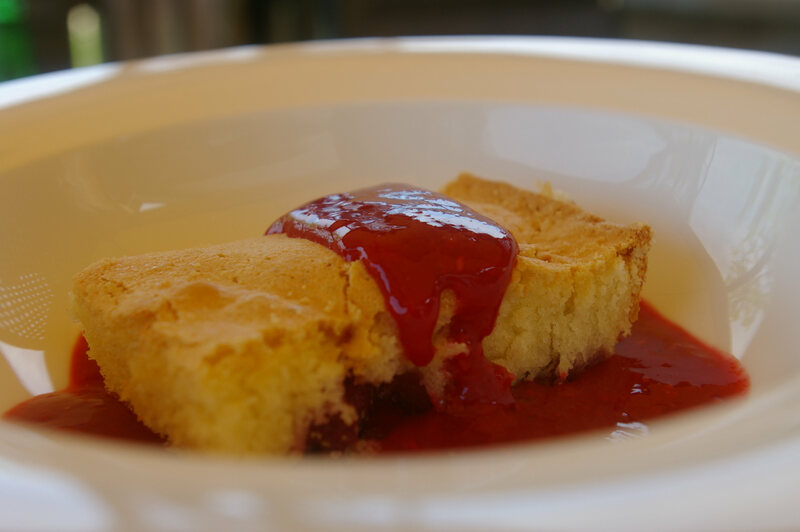 Head over to Marthe’s blog for the recipe and check out other TWD bloggers to see if they had more success than I did.